You'll be £10.39 closer to your next £10.00 credit when you purchase The Sages of Chelm and the Moon. What's this? The people of Chelm have a problem. They love to walk the streets at night under the light of the radiant moon. But every now and then, the moon disappears from the sky and they can’t find their way home. Perhaps someone is stealing it, or maybe it’s hiding on purpose? Being very clever, the wise people of Chelm know exactly what they must do. They will buy a brand-new moon – one that will shine clear and bright every night . . .
Shlomo Abas retells the story with a perfect comic touch and Omer Hoffmann illustrates the tale beautifully. A well illustrated tale with a sound story. I loved this funny little story which reminded me of Bulgarian Gabrovo tales. Beautiful quirky illustrations in exquisite colour schemes add to the kind humour of the story. I can see myself reading this book to my little one many, many times. Looking forward to more titles in the Chelmite series. This was great! 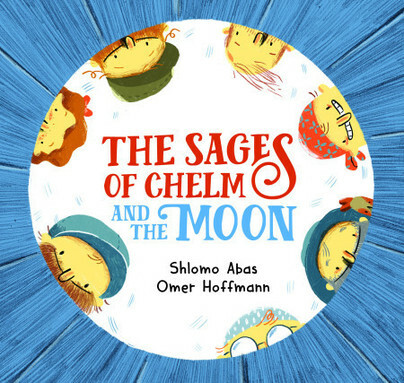 I love the Chelm stories! Right up there with the Nasruddin and Til Eulenspiegel stories I've heard over my lifetime. I am happy to see someone keeping these tales alive! Illustrations were wonderful! Shlomo Abas, born 1948, is one of the leading children's writers in Israel. He started writing children's literature at the age of 29. To date, he has published 164 books, of which 43 are his original work as children's books, while the other 121 books are fables, folktales, and legends which he has collected, compiled and edited. A majority of those deal with Jewish folklore and culture in all its diverse communities. Many of his books have become bestsellers. Omer Hoffmann is an Israeli illustrator. His diverse body of work includes illustrations for newspapers, children's books and comics worldwide. Omer's illustrations were selected for the Hans Christian Andersen Illustration Honour List 2016 for the book: Hardil lo ragill. He lives in Givatayim with his wife and their two children.